The Shasta-Trinity Forest is the largest national forest in California with a diverse landscape ranging from 14,162 feet in elevation. The 2.1 million acre forest encompasses five wilderness areas, hundreds of mountain lakes and 6,278 miles of streams and rivers. Hikers, backpackers and horseback riders will find over 460 miles of trails to explore. The trails range from wide trails with easy grades to rough rocky steep grades. The many natural lakes in the Trinity Alps offer a cool and beautiful destination for hikers and horseback riders using trails in the Alps. Some of the lake trails are short, while others are an all-day (or all-weekend) experience. Visitors are rewarded along the way with stunning views of granite pinnacles and deep crevasses that resemble the Swiss Alps, and wildlife and wildflower sightings. The Pacific Crest Trail travels through the northern part of Trinity County. The section next to Highway 3 at the top of Scott Mountain are easy access, short half mile walk for quick venture into the forest. Highly popular is the Weaver Basin Trail System. These community-managed trails follow the gold mining ditch lines as they traverse the mountain sides surrounding Weaverville, making for multiple easy access points from town. You won’t find a terrain park here, but there is plenty of technical single-track to keep you focused and in the zone. A Weaver Basin Trail System map is available. If you’re going into the Alps, you need a wilderness permit for anything beyond a day hike, and if you’re going to have anything with open flames, including a cook stove, you need a campfire permit as well. To get a permit, call the Forest Service at 530-623-2121. Horsemen, bicyclists, and hikers all join in on the two-day CSHA Weaver Basin Express poker run over the July Fourth weekend. The event is a fund-raiser for the American Endurance Ride Conference Trails Grant Fund, CSHA Royalty Scholarships, and a future equestrian campground in the Weaverville Community Forest. On October 3-4, 2015, Weaverville was the site of the World Solo 24 Hour Mountain Bike Championship Race. “WEMBO (World Endurance Mountain Bike Organization) is a group of like-minded mountain bike clubs and promoters from around the world with vast experience in hosting 24 Hour Mountain Bike Races. The founding members of Italy, Australia & Scotland have agreed to stage annual World Solo 24 Hour Mountain Bike Championship events to ensure the future of the sport of Solo 24 Hour racing at the highest level and to meet the needs of the riders”. These races have been held in Italy, Australia and, in 2014, they were held in Ft. William, Scotland. Approximately 120 riders participated. Team Bigfoot mapped the course for Weaverville and a steering committee oversaw the preparations for the event. More information is available at 530-623-6101, or Weaverville24, or on Facebook. Information are best found at any of the U.S. Forest Service ranger stations in Weaverville, Coffee Creek and Big Bar. 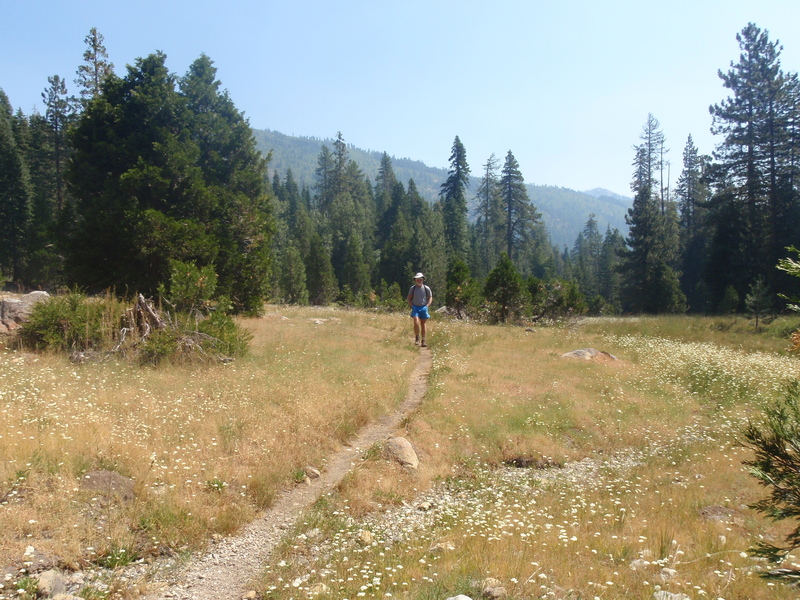 Information available includes a current Trinity Alps Wilderness trail condition report. Pick up a Recreation Visitors Guide at the Trinity County Chamber of Commerce or the Trinity Journal office both at Main Street! In Weaverville, Trinity Outdoors, next to Tops Market, is the place to “gear up,” get maps (including a Trinity Alps Wilderness map), and ask questions. Most recreation sites within the Shasta-Trinity are open from May 15 through September 15. During the remainder of the year, some sites may be kept open as needed or as weather permits. Recreational facilities that remain open will offer reduced services. Some water systems are turned off during the winter months. Camping at improved campgrounds is limited to the maximum number of days posted at the site (generally no more than 14 days). Camping outside of improved campgrounds (dispersed camping) is limited to thirty (30) days within a one (1) year period, starting with the first day of occupancy. Family campground fees range from $10 to $50 per day, depending on the types of services offered. Group campground fees range from $30 to $110 per night. Fee listings for individual cmapground are available upon request. There is a $5 fee for a second vehicle (if space allows) at some sites. Generally, dispersed camping is allowed outside of developed sites within the Shasta-Trinity unless otherwise posted. The exception to this is Lewiston Lake. Camping is prohibited within 1/4 mile of the high water mark with no exceptions. Pets are allowed in the recreation areas unless posted. They must be on a leash not longer than six feet, or otherwise under physical restrictive control when in a developed site. Campfire permits are required outside of a designated campsite and may be obtained free of charge from your nearest Forest Service, CalFire or Bureau of Land Management office. It is prohibited to discharge a firearm or any other implement capable of taking human life, causing injury, or damaging property: (1) in or within 150 yards of a residence, building, campsite, developed recreation site, or occupied area, or (2) across or on a Forest Development road, or a body of water adjacent thereto, or in any manner or place whereby any person or property is exposed to injury or damage as a result of such discharge. It is illegal to discharge or ignite a firecracker, rocket or other firework, or explosive on all National Forest lands and in Shasta County. 82% of Trinity County is covered in forest. It is up to all of us to try to leave no impact on the forest so that every hiker can enjoy the same beauty that you enjoyed. Campfires are the major cause of campsite deterioration at heavily used lakeshores. Responsible campers should not have a campfire in areas with scant vegetation. 90% of the nitrogen needed for plant growth comes from decaying vegetation, so burning up any wood in an area adversely affects the remaining living vegetation. If you must have a fire, please make it a small one and stoke it for only for a short period in the evening. And please, pack out all of your trash, completely extinguish campfires, and bury all body waste. Fire is always a big concern in Trinity County. Please be safe with camp fires!